The first thing we do on our way home from the airport upon arriving in Honolulu is to go to Jungs for shave ice. His new store across from Washington Intermediate School has off-street parking in the back and has tables and chairs to sit down inside. For more about Jungs go to Friends > family friends. We enjoyed dinner twice at Uncle Michaels and Aunty Nadines house. Here were about to enjoy a Hawaiian luau. Aunty Mary brought poi and vegetables from the Big Island and Aunty Nadine bought laulau and made lomi lomi salmon, chicken luau, haupia and other goodies. For Christmas dinner, Grandpa got a large 26-pound roast from his friends at Kahua Beef and Uncle Michael cooked it to perfection on his grill. After dinner we took a family portrait. Does it look like were stuffed? Look at grandpa. Here I am in the hothouse with poinsettias from Robert Miyashita, before we passed them out to friends and neighbors for the holidays. My friend Showko Kudoh, whom I worked with in Tokyo during my internship with Obayashi in the summer of 2002, came to Hawaii to visit for a very short 5 days with her parents, uncle and aunt. We had a very good time playing tourist. One of the first things we did was to have shave ice at Jungs. We also had lunch at the Hungry Lion, where the portions are quite large. Showko thought that having Chinese mustard with ramen was very strange. See Sakamoto > My Dad visits me in Japan page 6. We visited the Bishop Museum, where we saw artifacts from many cultures of influence in Hawaii. Here, were admiring a beautiful kimono. On our drive around the Island we stopped in Haleiwa for shave ice at Matsumotos. We stopped at the Court building, where Mom worked for the Supreme Court for two years. The statue of King Kamehameha is a popular photo spot for tourists. During Aloha Week and on Kamehamehas birthday, the statue is covered with flower leis reaching to the ground. The roots of a banyan tree on the grounds of Iolani Palace. We visited Honolulus Chinatown. Were standing across the street from the famous old Chinese restaurant Wo Fat, where 40 years ago Apos brother celebrated his 75th birthday. Click on the Au button then the Ching family picture at the top of the page to see a photo of the event. The Kudohs, Matsudas (Showkos aunt and uncle) and Sakamotos at Eastern Garden (now closed) after we enjoyed a Chinese dinner. We had dinner at Brew Moon, a microbrewery and restaurant at Ward Center. I found it funny that Showko couldnt tell the difference between Brew Moon and Blue Moon (and therefore couldnt understand the pun) because theres no difference in Japanese between an R and an L. See a discussion of Japanese pronunciation. 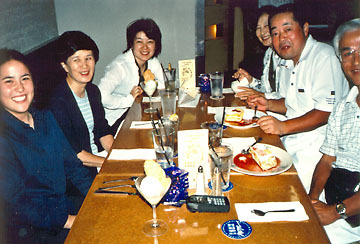 Top photo: me, Showkos mother, Showko, her aunt, her father, and her uncle Mr. Matsuda. Mr. & Mrs. Miyashita took Dad and me around to the North Shore to the Polynesian Cultural Center in Laie. On the way we stopped at the Valley of the Temples to see a replica of the Byodo-In Temple in Japan. This is an enlargement of the photo above, showing us waving back to Dad. I tried my hand at spear-throwing at one of the Polynesian villages in the Polynesian Cultural Center. I learned two songs in a ukulele class at the Center. There are always tourists willing to make complete fools of themselves. Here are Messieurs California, Maryland and Michigan. The evening performance at the Center is always spectacular. We enjoyed a nice Japanese dinner at Komakata in Aina Haina the night before we returned to the Bay Area.